Your website doesn’t have an SSL certificate. Does my website even need an SSL? What are the benefits of having an SSL? You’ll rank higher on Google – It’s true. Google gives preference to websites with an SSL certificate over websites that don’t have one. While it alone won’t guarantee a first page placement, NOT having an SSL certificate will absolutely guarantee that your website ranks LOWER than it should. 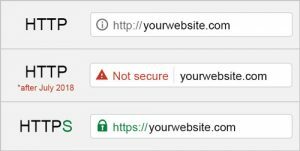 You’ll future-proof your site from the scary ‘NOT SECURE’ message – Starting in July 2018, Google Chrome will begin displaying ‘NOT SECURE’ in the address bar of any page where a user can enter data. Since Chrome is currently the most widely used web browser (nearly 60% market share), this is something you’ll want to be ready for. You’ll tell your visitors that your site is verified, safe, and secure – When your website can show the HTTPS and green padlock in the address bar, your visitors can have confidence that their activity on your site is private and protected. In other words, they’ll feel better and you’ll look better. Gone are the days when SSL certificates were just for e-commerce websites or those web forms that asked you for your social security number. Now SSL certificates are important for ALL websites. Do you want to boost your SEO ranking on the world’s largest search engine, Google? Does your website use contact forms, search bars, customer/partner login pages, etc? If you answered “yes” to either of these questions, we can help. 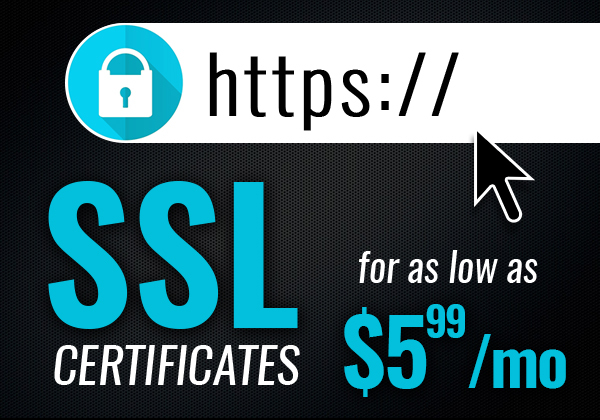 Get an SSL certificate on your site today for as low as $5.99/month!